We’d love your help. Let us know what’s wrong with this preview of Riverland by Fran Wilde. To ask other readers questions about Riverland, please sign up. This was a hard book to follow. The fantasy part was confusing. The heart of the story was in the love that sisters Eleanor and Mike shared for each other. There is violence among the parents, but the girls find safety for themselves. They both have good friends and there are adults along the way they learn to trust. Gorgeous. Dark. Dread-filled. Beautifully written. Full of terrible truths, different kinds of magic, and the real complexities of sisterly love - and a hard-won hope by the end. To be entirely (embarrassingly) honest, I found it painful to read because ever since I had kids of my own, I've gotten massively stressed by reading emotionally intense kids-in-real-peril storylines. There were parts of this book where I couldn't breathe because I was so personally stressed by my fear for these kids, a Gorgeous. Dark. Dread-filled. Beautifully written. Full of terrible truths, different kinds of magic, and the real complexities of sisterly love - and a hard-won hope by the end. To be entirely (embarrassingly) honest, I found it painful to read because ever since I had kids of my own, I've gotten massively stressed by reading emotionally intense kids-in-real-peril storylines. There were parts of this book where I couldn't breathe because I was so personally stressed by my fear for these kids, and my stress about their welfare took away from the pleasure I should have taken in the powerful writing and themes. However, I'm pretty sure that before parenting made me such a wimp I would have simply been blown away by how well done it all is. I know this book will be massively important for kids who face these painful issues in real life and need both this representation on-page AND the hope at the end of the story - that things CAN get better, really and truly, and that your first home doesn't have to be your whole story. A touching story about two sisters growing up in a house where "house magic" always fixes the things that get broken in their father's rages... until it doesn't, and the girls must find their own powers. I especially liked their growing relationship with their grandmother, and the hopeful but realistic ending. A good book for readers who like stories where reality and fantasy sit side by side. I was lucky enough to receive an advance copy of this book. This book deals with a difficult subject with grace and without sugar coating the reality of the struggle and challenges the main character faces. The ending pulled at my heart so much that I started reading from beginning again as I too wasn't ready to leave the secret world that Wilde had carefully crafted. Trigger warning: Mention of bad temper regarding the MCs father. Up till the point I read. I was really looking forward to reading this book! Unfortunately I didn’t like it. To put it simply I started losing interest while reading. I couldn’t wrap my head around the beginning and while I wanted to read more, I couldn’t bring myself to. Riverland is a glorious addition to the fantasy ouevre of Fran Wilde, who has already given the world works of fiction -both long and short - that are singular in their beauty and depth. Her latest book, the YA novel "Riverland", is beautifully written, emotional, and fierce in its portrayal of sisterly love as a source of strength and renewal. Wilde has given her whole heart to this story, and it shows in so many ways - in the psychological strategies of children to survive and cope in an abusi Riverland is a glorious addition to the fantasy ouevre of Fran Wilde, who has already given the world works of fiction -both long and short - that are singular in their beauty and depth. Her latest book, the YA novel "Riverland", is beautifully written, emotional, and fierce in its portrayal of sisterly love as a source of strength and renewal. Wilde has given her whole heart to this story, and it shows in so many ways - in the psychological strategies of children to survive and cope in an abusive household, in the determination to do right and to rise above fear, in the struggles of light against the dark. A magical read that touches on the very real=life topic of domestic violence. While Riverland is aimed at the middle grade reader, the content is also extremely relatable and appropriate for young adult and adult readers. This book shows the real life consequences of living with abuse in the home and as the writer shares, she hopes her work will be accessible on a bookshelf for those who need it most. The author is a skilled writer and I enjoyed the flow of the story. The plot is solid and I loo A magical read that touches on the very real=life topic of domestic violence. 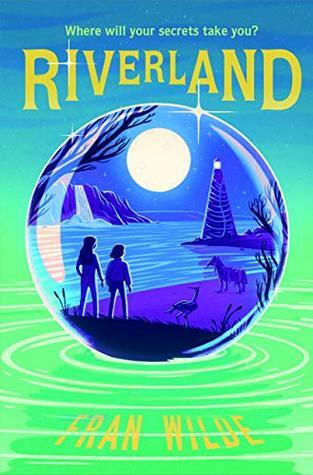 While Riverland is aimed at the middle grade reader, the content is also extremely relatable and appropriate for young adult and adult readers. This book shows the real life consequences of living with abuse in the home and as the writer shares, she hopes her work will be accessible on a bookshelf for those who need it most. The author is a skilled writer and I enjoyed the flow of the story. The plot is solid and I look forward to reading more from Fran Wilde. Beautifully written and a much needed story. 2.5 rounded up to 3. I just couldn’t get into this one, even though I really wanted to. I applaud YA that gets readers into fantasy genre, and I hope this works for some young readers! This review has been hidden because it contains spoilers. To view it, click here. This is a YA / middle grade book that deals with violence in the home and uses a portal fantasy framework for the sisters to deal with what happens at home. A portal to Riverland appears under Eleanor’s bed and both girls tumble into a river basin area where so many things are made up of trash that has come through from our world. Turns out there is a compact between Riverland and sister’s family that goes back generations, but no one knows about it now. Now Eleanor must try and keep up a facade This is a YA / middle grade book that deals with violence in the home and uses a portal fantasy framework for the sisters to deal with what happens at home. A portal to Riverland appears under Eleanor’s bed and both girls tumble into a river basin area where so many things are made up of trash that has come through from our world. Turns out there is a compact between Riverland and sister’s family that goes back generations, but no one knows about it now. Now Eleanor must try and keep up a facade of peace at home and solve the problems of Riverland and still do well at school. This was a bit of a hard read because the anger isn’t glossed over that the girls go thought and there is no perfect solution the problems, but it certainly makes for a better book because of it. What I did like about Riverland was the strong bond between the sisters Eleanor and Mike. Eleanor does her best to shield her sister from Poppa's outbursts and tempers, and she does what she can to make sure Mike still sees things in a child-like way, as she should. Eleanor has her own issues, though, because she feels helpless and powerless, and the way Poppa speaks to her hardly helps. She hopes to be brave and strong for others. The one aspect that was critical to the story was the way Eleanor and Mike dealt with the abusive relationships at home. Children have to deal with some truly horrible things at times, and the way the topic was approached showed not only the issues of domestic violence but also the wider ramifications of what it means to grow up in an abusive household. Eleanor and Mike bear the brunt of what happens between their Poppa and Momma. What Eleanor's friend Pendra thinks is magical about her home is really just her mother picking things up after her father's rages. They are all compensating for their Poppa's anger and the damage he does. The way the girls and their mother deal with the father's temper and lashing out follows a pattern that is ingrained in them. There is denial, escapism, belief that stronger forces are at work. The unwillingness to accept help or admit the abuse. The fear of speaking out and being honest. They are constantly doing their best to hide the issues in their family from teachers, their grandmother, and the counselor. Overall, Riverland didn't entirely hit the mark for me. I wanted to like the fantasy world and was looking forward to an Alice-in-Wonderland-like adventure. I also hoped for more developed characters overall, especially the adults. Even with these important scenes between the sisters, where they try to protect each other, I spent the first half of the book really unsure of what Riverland was, how the creatures in it were connected, who the characters were meant to be, and what was going on even in the real world ... and the second half of the book didn't answer these questions as much as I would have liked. I was admittedly confused at times by the nature of Riverland and the creatures. The moments in and out of Riverland felt fragmented between bouts in the real world above. Of course, handling the topic of domestic abuse with young children is a sensitive thing. This book might help bring up difficult topics for discussion and allow for the building of empathy. I loved this book. I had to sit with the story for a little while after reading it before I wrote this review, because there is so much I want to say. First, young readers need more books like this--books that show them families are not always perfect and sometimes they they're broken and that's okay. Books about siblings finding strength in each other when things fall apart. Books that make you believe in magic even if that magic is just about trusting you are a good person who has flaws but th I loved this book. I had to sit with the story for a little while after reading it before I wrote this review, because there is so much I want to say. First, young readers need more books like this--books that show them families are not always perfect and sometimes they they're broken and that's okay. Books about siblings finding strength in each other when things fall apart. Books that make you believe in magic even if that magic is just about trusting you are a good person who has flaws but that's okay too. Yes, it's also a book about domestic violence, and yes at times it was painful to read, but Wilde does such a beautiful job of carrying the reader through the transitions and making them feel safe even in the dark places. There are moments of such beauty in Riverland, in the smallest of things (like newborn dreams), and there are moments when everything breaks and falls apart; both will leave you breathless. Note: review based on an advance reader's copy of the novel, which was provided without expectation of a review. So this book is a bit of a rough read—it’s about a girl in a physically and emotionally abusive home, trying to protect her younger sister and herself, when a river to a magical place appears under her bed. There is some good stuff here about learning to trust, and I liked the relationship between the sisters, but I wanted a bit more from the ending. B+. A review copy was provided by the publisher, this book will be released in April. Middle grade fiction, dealing with hard topics of anger and feelings in oneself and in families. The message and theme of the book are important, but the pacing was off. Needed a little levity amongst all the hardness. Though initially delighted to get my hands on an advanced copy of Riverland, I soon felt burdened by the task of getting through what I had expected to be a fun and fast read. It strikes me as one of those books that simply should have been better. The author seems to be smart and a good writer. She presents an interesting concept with lots of unique elements to make it stick out, but somewhere in the writing process it must have just fallen apart. The way the story unravels is the real heart of Though initially delighted to get my hands on an advanced copy of Riverland, I soon felt burdened by the task of getting through what I had expected to be a fun and fast read. It strikes me as one of those books that simply should have been better. The author seems to be smart and a good writer. She presents an interesting concept with lots of unique elements to make it stick out, but somewhere in the writing process it must have just fallen apart. The way the story unravels is the real heart of the matter. During the sisters's first journey to the magical other-world, the stakes are set pretty high; the boundaries between reality and the world of dreams are collapsing, and it is our heroines's responsibility to fix it. I strapped myself in for a tense fantasy with lots of harrowing near-misses and a constant clock ticking down to doomsday. But then the girls go back to their world and just... Go about their normal lives for a couple days? Most of the subsequent returns to the dream-world, a place they can only visit at night lest they get trapped there, are spent just lazily touring around, and these visits always end with a mad dash back to their world. The emotions that any one chapter were meant to evoke in the reader felt totally incongruous. For a while, I thought Fran Wilde was employing a clever gimmick by having the tone of and movement through the dream-world reflect how time often unwinds at weird rates in dreams. In the same way, I assumed Wilde's poetic writing style and her descriptions that managed to be both very specific and fuzzy-'round-the-edges were a part of a dream motif. Since neither of these were ever proven to be on purpose, I assume they were just flukes. Riverland is one of those tender middle grade books. While it's a story about magical places, of battles between nightmares and dreams, at the heart of this story is the relationship between Eleanor and Mike - their fear and love - as they navigate their family and their father's temper. Faced with a reality of rules, house magic, and broken dishes, Eleanor tells Mike stories in their refuge under her bed. But when the house starts springing leaks and a puddle appears under her bed, Eleanor may be in for more than she can handle.